Patreon... it's GOOD for ya! Where Do We Get Our Food? To say the least, I could have been a LOT more descriptive, even painfully so, in the first panel of the cartoon, so count your blessings. Yes, yes, I know. We all get our protein globs nowadays from the local megamarket, where the magic Meat Fairies fill the produce cases every night with steaks and chops and ribs painlessly removed from donor animals willing to do their patriotic duty of filling the bellies of grateful Americans. No gouts of blood, no piles of viscera, no nails to the head, just loads of tasty fat and muscle guaranteed to put a smile on your face and plaque in your arteries. Where do we get food? Well, you take a gun and go into the woods and, if you're lucky, you shoot an animal. Then you slice it into small pieces and throw away the blood and guts, taking care to avoid getting brucellosis or tuberculosis. 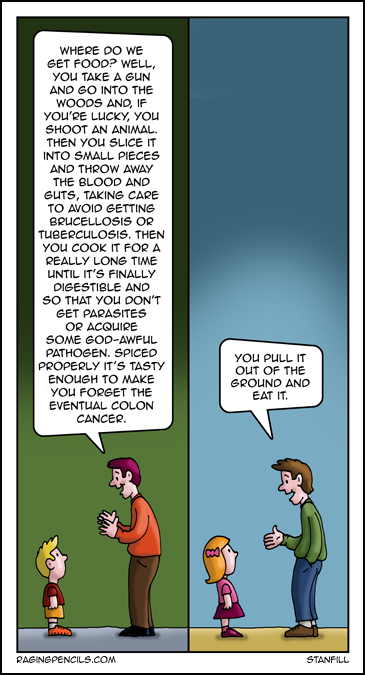 Then you cook it for a really long time until it's finally digestible and so that you don't get parasites or acquire some god-awful pathogen. Spiced properly it’s tasty enough to make you forget the eventual colon cancer. You pull it out of the ground and eat it.